Many of the names given below appear on more than one of the local War Memorials. This is because a number of very small parishes meet in this area and it can be difficult to assign any given house to a particular parish without consulting the parish maps. Each man would have been a familiar figure in all of the neighbouring villages. 266256 Private Lionel John Beardon ("John") of the 1st/6th Battalion, the Devonshire Regiment. Son of William and Ellen Beardon of Hollocombe. Born in Chulmleigh in the March Quarter of 1898. Died 23 April 1918 aged 20. 133460 Driver Percy Beardon of the 27th Reserve Battery, the Royal Field Artillery. Son of John and Elizabeth Beardon of Hollocombe. Born in Winkleigh in the March Quarter of 1887. Died 10 October 1918 aged 31. 95420 Private William Berry of the 2nd Battalion, the Royal Fusiliers. Son of Benjamin and Ellen Berry of Hollocombe. Born in Winkleigh in the September Quarter of 1892. Died 4 October 1918 aged 26. 10684 Private Charles Thomas Cruwys of the 8th (Service) Battalion, the Devonshire Regiment. Parents not yet traced. Born in Wembworthy in 1893. Died 25 September 1915 aged 22. 3472 Private Walter Dimond of the 2nd/6th Battalion, the Devonshire Regiment. Son of George and Sarah Ann Dimond of Dolton. Born in Dolton in the December Quarter of 1885. Died 4 September 1916 aged 31. Also commemorated on the Dolton War Memorial. 13014 Private George Gane of the 9th (Service) Battalion, the Devonshire Regiment. Son of the late Charles and Emily Gane of Wembworthy. Born in Keynsham in 1895 and brought up by his grandmother who lived at Spekes Cross. Died 12 Jul 1916 aged 20. 10673 Private Henry Griffin of the 8th (Service) Battalion, the Devonshire Regiment. Parents not yet identified. Lived in Ottery St. Mary. Born in Wembworthy in 1893. Died 25 September 1915. Lieutenant Hugh Peter Hartnoll of the 1st Battalion, the Worcestershire Regiment. Son of Sir Henry Sullivan and Lady Hartnoll of the Old Glebe, Wembworthy. Born in Lower Burma in 1894. Died 12 December 1914 aged 20. 10675 Private William Henry Hulland of the 8th (Service) Battalion, the Devonshire Regiment. Son of Henry and Charlotte Hulland. Born in Chulmleigh in 1883. Died 25 September 1915 aged 32. 10679 Private William Leaman of the 8th (Service) Battalion, the Devonshire Regiment. Son of Richard and Emma Leaman. Born in Chagford in 1882. Died 25 September 1915 aged 32. 36165 Sapper Percy Molland of "L" Signal Company, the Royal Engineers. Son of Richard and Bessie Molland of Homeleigh, Hollocombe. Born in Winkleigh in the December Quarter of 1886. Died 11 November 1918 aged 32. 19308 Lance Corporal William John Parrish of the 5th Battalion, the Dorsetshire Regiment; formerly 2430 of the Royal North Devon Hussars. Son of William and Frances Parish of Bridge Reeve, Wembworthy. Born in Wembworthy in the March Quarter of 1894. Died 24 November 1916 aged 22. 7312 Gunner Frederick Pidgeon of "B" battery, 286th Brigade, the Royal Field Artillery. Son of William and Fanny Pidgeon of the Lymington Arms, Wembworthy. Born in Wembworthy in 1897. Died 9 April 1918 aged 20. 11202 Private Thomas Trigger Piper of the 1st Battalion, the Devonshire Regiment. 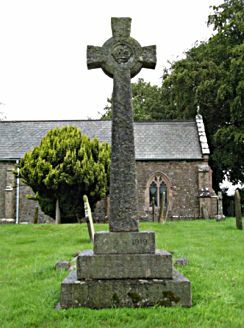 Son of John and Elizabeth Piper of Four Ways, Eggesford. Born in Eggesford in the June Quarter of 1895. Died 12 May 1915 aged 20. 15703 Acting Corporal Francis Herbert Richards of the 8th (Service) Battalion, the Devonshire Regiment. Son of Anthony and Harriet Richards of Winkleigh (his father was born in Wembworthy). Born in Coldridge in the September Quarter of 1893. Died 2 April 1917 aged 23.